There's so much to love about this Royal Orchid Border Print Caftan—from its gorgeous royal blue and orchid print to its lightweight, flowing fabric which feels light and drapes beautifully. 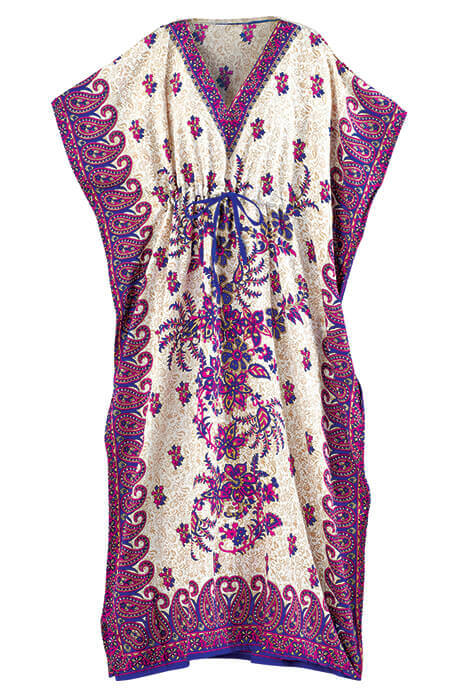 A perfect choice for lounging or wearing as a swim-suit cover-up, its thoughtful caftan dress design features a contrasting paisley-print border at V-neck and along sides, plus an adjustable tie front, which allows you to customize the fit and add a bit of flattering waist definition. Designed exclusively by Sawyer Creek Studio™. One size fits most. 100% polyester; machine wash. Imported.